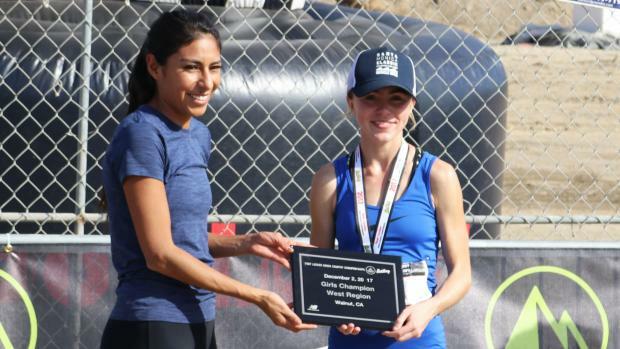 Two juniors won Foot Locker West Regional titles on Saturday, overcoming a hilly, warm and dusty Mt. San Antonio College 5,000-meter course to earn a trip to the national finals next Saturday in San Diego. Whereas Californian Claudia Lane ran away from the field early in her 5K in a staggering 16:59.6, New Mexico's Kashon Harrison had to separate himself from a pack and then win an "Airstrip" sprint to the tape to win Saturday at Mt. San Antonio College in Walnut, Calif.
Lane, a junior from Malibu and the defending Foot Locker National champion, was challenged only at the tight start across an asphalt parking lot and through a tight path known as "The Saddle" (because it is a valley pathway between two hills). Once into the open, Lane was well on her way to a second consecutive FLW Regional title before the first mile marker. She was a 72.2-second winner over runner-up Katie Thronson of Spokane (WA), who admitted that Lane was so far out of sight that it felt like she was running with the lead. In October, Lane shattered Sarah Baxter's Mt. SAC three-mile record, obliterating the modified layout in 15:49 to win the D1/D2 Individual Sweepstakes. Baxter's 2012 meet record of 16:00 was previously considering one of -- if not the -- most impressive high school girls cross country performances of all time. Lane continued to rewrite history on Saturday. 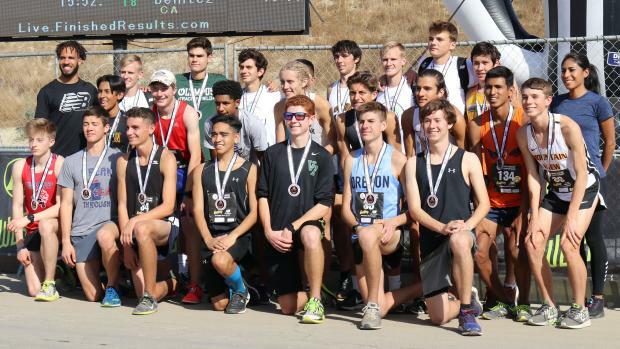 The top 10 finishers in the girls and boys seeded races made up the teams that will represent the West Region in the Dec. 9 Foot Locker National Championships on the 5,000-meter Morley Field course in San Diego's Balboa Park. Meika Beaudoin-Rousseau, a senior from San Jose Bellarmine Prep, was the only returning boys qualifier from last year's FLW Regional. Beaudoin-Rousseau challenged Harrison until the final strides, as the Kirtland (NM) Central junior was first to the tape first. Harrison won in 15:38.4. Beaudoin-Rousseau crossed in 15:41.4. Lane led five California girls onto the West team. 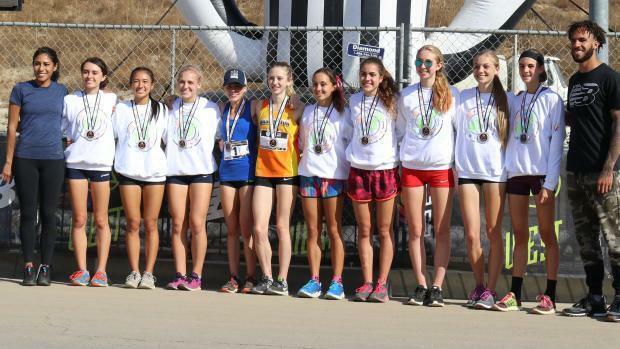 She is joined by Aliza Hartke (Oakmont, senior; fourth in 18:17.8), Alyssa Bautista (Capistrano Valley, senior; fifth 18:18.0); Chole Arriaga (Walnut, junior; seventh 18:19.7), and Patricia Miessner (Chula Vista Eastlake, sophomore; 10th, 18:26.0.). Also on the girls West team: Camille Winterton (Salt Lake City (UT) Skyline), senior; third 18:16.3); Kristen Garcia (Sedro Wooley (WA), senior; sixth, 18:19.5); Annika Reiss (Bellingham (WA), junior; eighth 18:21.7) and Alissa Fielding (Orem Mountain View (Utah), senior; ninth, 18:23.5). Thronson is the Washington State 4A champion and Garcia and Reiss went 1-2 in the Washington 2A final. Other Californians joining Beaudoin-Rousseau on the West team are Joaquin Martinez de Pinillos (San Diego Cathedral Catholic, senior; third 15:43.4), Collin Ullrich (Galt Liberty Ranch, senior; sixth, 15:45.4) and Darius Riley (Rancho Cucamonga, senior; ninth, 15:51.3). Others on the West team are Zachary Winter (Ogden (UT) Fremont, senior; fourth, 15:44.7), Roberto Porras (Utah; fifth, 15:45.1); Bronson Winter (Ogden (UT) Fremont, senior; seventh 15:45.7); Turlan Morlan (Spokane (WA) Gonzaga Prep, senior; eighth, 15:49.5), and Justin Hartshorn (Highland (UT) Lone Peak, senior; 10th, 15:54.0). Hartshorn was on pace for a higher finish but lost his balance and fell just inches from the finish line. He was able to gather himself and lunge over the line into the last FLN qualifying position. 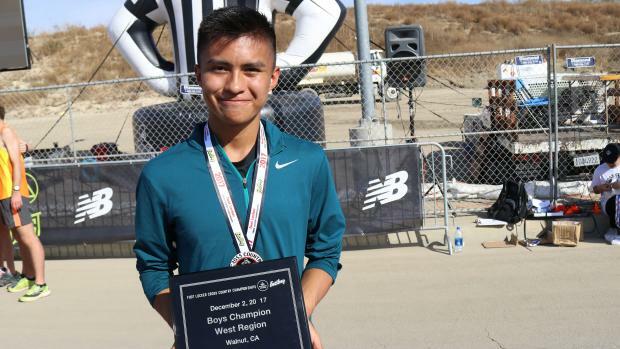 As a frosh, Harrison won the Foot Locker West Regional Freshman race. He is the New Mexico 5A champion and was recently eighth at the Nike Cross Southwest Regional. Harrison was 13th at the FLW Regional last year and was the No. 4 returner. Bronson Winter, a senior from Ogden (UT) Fremont, is the Utah 6A champion and a three-time FLW participant. He was 19th last year at FLW.